As one of the principal coniferous species of commercial importance in Bulgaria, Scots Pine has been subjected to strict management, which has posed a challenge for the conservation and management of its gene pool. In this study, we measured genetic diversity and population structure using 6 microsatellite loci in 12 populations from Bulgarian mountain ranges. Our analysis showed good intrapopulation divergence (18.22%; AMOVA) and genetic evidence of bottlenecks. “NJ-IAM” and “non-admixing” clusters divided the populations into 3 large groups. Our microsatellite analysis was consistent with the documented “mountain effect” influence on genetic diversity. Two methods—the Coalescent Bayesian model and M-stat analysis—implicated recent bottlenecks for all populations, suggesting that the genetic structure of Bulgarian Scots Pine was shaped over a long period (one thousand generations; i.e. 20,000 years) by the interaction of genetic and autoecological processes. Our results suggest that conservation and management practices should strive to maintain this genetic differentiation, specifically by emphasizing reforestation efforts with stocks from local provenances to avoid nonlocal introductions. We thank Irena M. Naydenova and M. H. Longpré for their technical assistance. We are grateful to the staff of the Bulgarian forest service for their assistance with the plant material; the Ministry of Education and Science of Bulgaria for their financial support (CC-318/1993–1996); and the Fond KAZAROVI-Geneva (Switzerland) for a student grant to K. D. Naydenov during an internship at the University of Geneva (Department of Botany). We also wish to thank W. Parsons (University of Sherbrook) and BLUE PENCIL-SCIENCE (USA) for his careful revision of this manuscript. 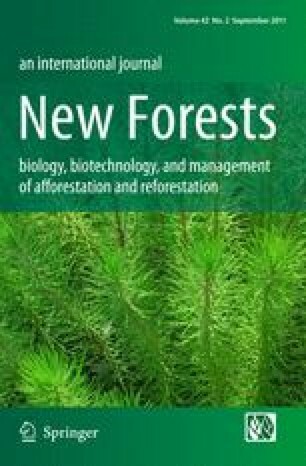 This study was funded by a post-doctoral grant to K. D. Naydenov from the “Chaire en aménagement forestier durable”, while other financial support was provided by a Natural Sciences and Engineering Research Council of Canada (NSERC) operating grant to F. Tremblay.